General Motors today said that thanks to strong public interest in the Chevrolet Volt, the 340-mile extended range electric vehicle, it will increase U.S. production capacity of the groundbreaking new car by 50 percent, from 30,000 units to 45,000 units, in 2012. The expanded U.S. production capacity is the latest in a series of positive developments for the Chevrolet Volt. This week, participating Chevrolet dealers in launch markets began taking customer orders for the 2011 Chevrolet Volt, following the release of retail and lease pricing. The brand also recently announced unprecedented battery and vehicle limited warranties to bring value and peace of mind to Volt customers. And the number of U.S. launch markets for the vehicle recently was raised from three to seven. GM has said it expects demand for the Volt to exceed the 10,000 units it will build between its launch and the end of 2011. In the past few weeks, more than 25,000 people have joined the Chevrolet Volt enthusiast list. More than 73,000 people have registered to receive product information from GM's Chevrolet Volt site, spokesman David Darovitz said. On Tuesday, the day GM released the Volt's pricing, the site saw a 700 percent increase in visits and a 1,200 percent increase in registrations compared with the site's daily average, Darovitz said. The Volt offers a total driving range of about 340 miles and is powered by electricity at all times. For up to the first 40 miles, the vehicle drives gas- and tailpipe-emissions-free using electricity stored in its 16-kWh lithium-ion battery. When the Volt’s battery runs low, a gas-powered, engine/generator seamlessly operates to extend the driving range another 300 miles on a full tank. 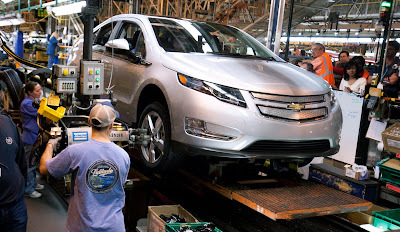 The Detroit-Hamtramck plant received $336 million in new investment to prepare for production of the Volt, part of more than $700 million GM has invested in eight Michigan facilities to support Volt production since 2008. This includes a 33,000 square-foot battery systems lab in Warren; a battery assembly facility in Brownstown Township; and supporting engine and stamping operations in Grand Blanc, Bay City, and three plants in Flint. Besides direct GM jobs, the Volt has helped spur additional supplier employment and investment. Earlier this month, battery cell supplier LG Chem/Compact Power Inc. broke ground on a $300 million, 650,000 square-foot plant in Holland, Mich., to support Volt production, creating 400 jobs. In addition, the Volt helped start an electrification trend. Since its debut in January 2007, other automakers have announced 30 plug-in hybrid or electric vehicles.